I’m a big fan and a happy cadet of Dan Roam and his Napkin Academy. Dan’s first book The Back of the Napkin was a major step forward in visual communications for business, government and everyday folks who need to solve wicked problems. In the pantheon of visual communicators, Dan stands as one of the most down-to-earth and friendly people I’ve met. So it’s always a pleasure to keep up with what he’s up to. And apparently he’s up to a new book, one focused on making presentations that rock. I joined in the Napkin Academy Live webcast today and sketchnoted my favorite messages. Can’t wait to get the book when it comes out in 2014. 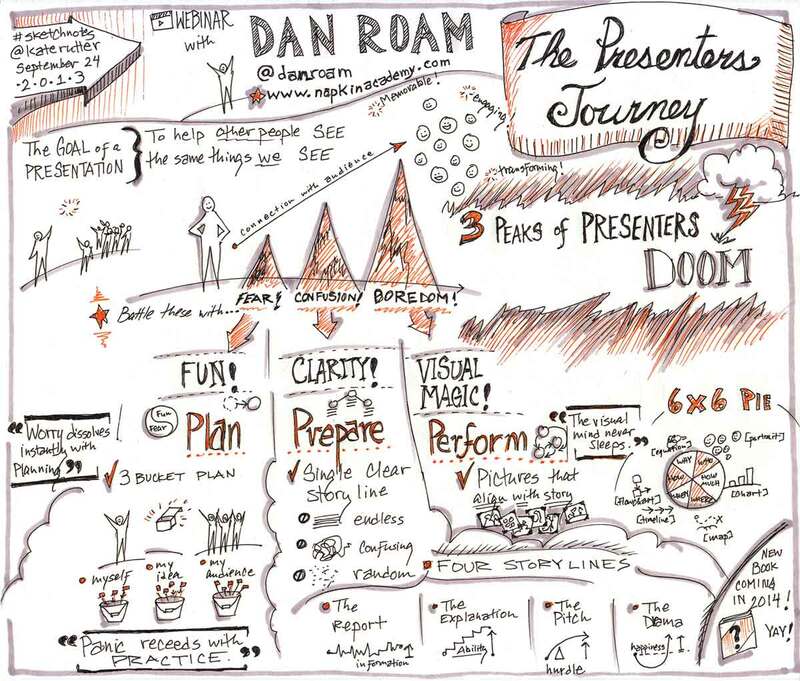 If you like what you see, check out the Napkin Academy, where Dan has created a strong community of visual communicators. The membership is worth every penny.